FONTANA, Calif. - Rookie sensation Mark Taylor captured the 2003 Menards Infiniti Pro Series championship in style with a decisive win at the California 100 Sept. 20 at California Speedway. It was Taylor’s seventh win of the season, a series record. “It’s how I wanted to finish it: to win the race and win the championship,” said Taylor, who leads Jeff Simmons 466-367 to clinch the title with one race remaining. “I could have finished third today and won the championship, but it was important for me to win it because it’s been such a great car for me. Freedom 100 winner Ed Carpenter battled Taylor for much of the race en route to his third runner-up finish of the season. “The wind really made it hard,” Carpenter said. “Mark was pushing in Turns 1 and 2. I was pushing. I think everyone behind me was pushing. Being in second place was a disadvantage because (Taylor) was able to take a little bit more air off my wing, and we were already having problems pushing. Thiago Medeiros finished third in the No. 36 Genoa Racing Dallara, followed by G.J. Mennen in the No. 25 Automatic Fire Sprinklers entry. Billy Roe, in the No. 24 Team ISI Dallara, rounded out the top five. Taylor, who started from the pole, led all 50 laps of the California 100, the fifth time in series history that a driver has led every lap of a race. Taylor also led every lap en route to victories at Phoenix and Nashville. Ryan Hampton led every lap at Gateway in 2002, while Jeff Simmons achieved the feat at Kentucky in August. Taylor earned his first Menards Infiniti Pro Series win in the season opener at Homestead-Miami Speedway. 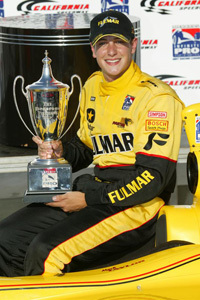 The 25-year-old from London also earned victories at Phoenix, Kansas, Nashville, Michigan, and Chicagoland before clinching the championship with his win at California Speedway.